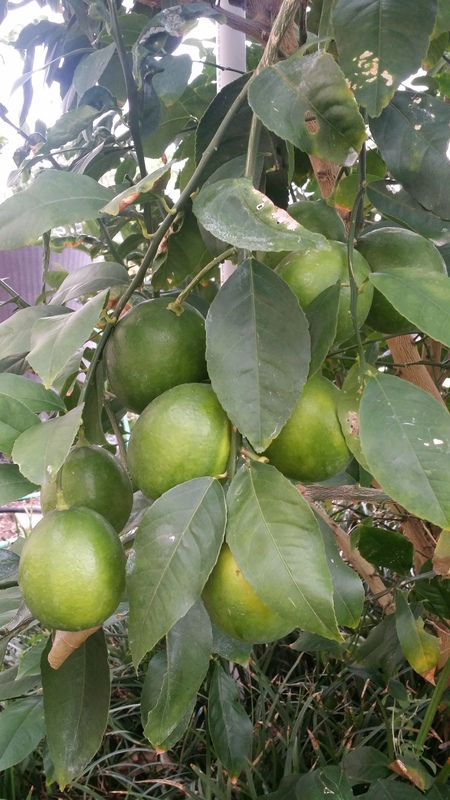 The Meyer Lemons are nearly ready for harvesting. The last few weeks of the process seems to be the longest— the waiting and checking part. Last year the tree froze late in the Spring and did not set any lemon fruit. This year, it’s apparent that the tree has recovered from that freeze. The flavor of Meyer lemons is considerably less acidic than many other lemons — probably because these lemons originated as a cross between a lemon and an orange. Due to the sweetness in their flavor, Meyer lemons will produce slightly different results in cooking and baking products — as compared to a more acidic lemon. The skins are thin and extremely fragrant, but these lemons do not ship or store well. Not a problem for me — they make wonderful gifts for hosts of seasonal parties! On the down side — Meyer lemons can be a carrier of the Citrus Tristeza virus so purchase and plant only virus-free plants to keep that devastating virus from spreading to other citrus. For now, I’ll just wait for the ripening to complete. ← Sweet Potato Vines—very Proliferic!